IF you have an alt toon you'd like to join up with. Just hit our cross faction channel for an invite ! I've been making sure to ask people when I'm on one of my UFP toons to let me know if they have KDF not in a fleet yet and would like to join. 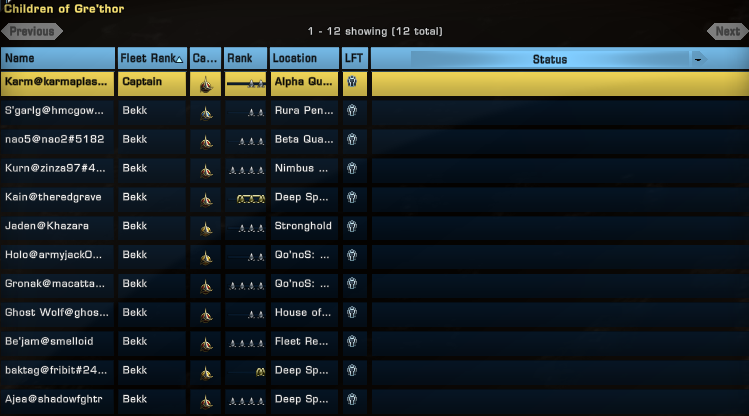 Oh, and whoever decided to promote me to fleet rank 6, thank you - not sure what I did to deserve it, but thanks! "The best diplomat I know is a fully activated phaser bank." - Scotty in "A Taste of Armageddon"
Hi all - been a while, so popped in to give a quick update. CoG is now at 97 members, the highest I've seen since joining back in March 2016, but we could always use more! To all the new players on the UFP side: If you have a KDF toon that's not in a fleet or is in another and you'd like to join CoG, send me a mail in game (K'Jamda@dp1149) with the name@handle, and I'll get you an invite ASAP. I'm usually on every day to do the daily stuff (reps, farming, etc.) so it shouldn't be more than a couple of days.